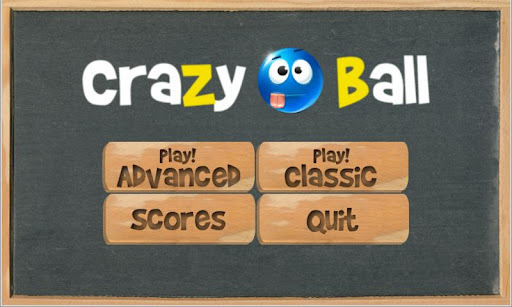 Swarm Blog: Go Wild With Android Game Crazy Ball! Do you love to get crazy? A popular song claims we are never going to survive unless we get a little crazy. How do you get a "little" crazy though? You could dance on tables, or you could snow ski in your underwear. Those are all viable ways to go a little crazy, but the better option is to play Crazy Ball. This free game for Android is simple and addictive. By moving the mobile device you can control the virtual ball and escape enemies, challenging friends to see who can last the longest. The global online scoring system supported by Swarm integration is the perfect way to add a little extra to the competition. Keep tabs on where you stand in the leaderboards, and challenge friends worldwide to top your score. There are two modes of play; classic and advanced. The classic mode sticks to the basics, while advanced game play allows for even higher scoring by collecting certain objects. Do not let the crucial part of survival, the crazy part, elude you. Stay in this world and on the battlefield for a long time to come by downloading Crazy Ball for free. It is interactive, which adds something other mobile games do not have, it is challenging, and yet it is simple enough that you can play for a short period of time or for hours on end and stay entertained either way.